Alice shared her Copper Glo review, a copper cleaning product which is made by the manufacturers of Bar Keepers Friend. This is the brand that I have used for many years. I use it mostly to clean my set of copper pots and pans, but I have also used it to clean the sink and stove top as well. I generally use it when the pots and pans become dingy and spotty, typically every couple of months. It really is amazing and it is very easy to use. What I do is shake it from the can onto the item I plan to clean and then I add a little bit of water. There is no wait time. I immediately just scrub the pot or pan with a sponge. The pots and pans return to their original brightness after they are polished. The Copper Glo removes the spots and leaves a bright sheen and finish on them. I have never had this product ruin anything that I have used it on. It is also easy to find at a local grocery store in the cleaning products aisle. Thanks Alice for your review of this product. It is great to be able to find something you can use on your pots and pans, since with use they can start to look pretty rough, and part of the appeal of copper pots is their beautiful color and glow. doing a bit of research on this cleaner and polish I learned it can be used on some other metals besides just copper, including brass, chrome, and stainless steel. I'd love to hear from people who have used it on these surfaces too, to share how it works on them. I would also love to hear from even more people who have used this product, or any other product to clean copper items in their home. You can share your copper cleaner reviews or cleaning tips here, or read other tips and reviews which have already been submitted. I just can't believe that they have DISCONTINUED Cooper Glo. I was told to try Bar Keepers Friend, I had tried it I the past and it is NOT the same. Wish I knew why they are not making it. I only came to the conclusion it was no longer in production by heading to the manufacturer's website and seeing it no longer for sale. It has now been discontinued as of approximately 2012. If you like this product I would suggest stocking up with a few cans now, before the supplies dwindle and you can't find it anymore. I would also love to hear from others who have tried the suggested replacement, Bar Keepers Friend powder, to share how it works on copper to know if it will be a suitable replacement or not. You can share your review here. Looking For A Replacement Copper Cleaner & Polish? If you're looking for a replacement product now that this has been discontinued, make sure to check out these copper cleaning product reviews from other readers. A reader, gardngal, shared another use for this product that worked well for her, to remove lime scale from glass. 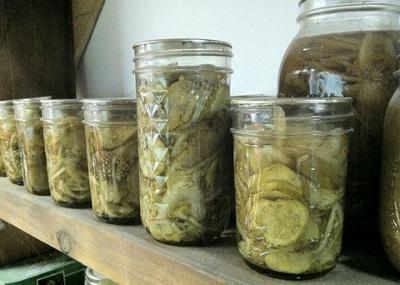 Today I needed a cleaner to remove residue from glass gallon pickle jars that were etched with lime. Guess what I tried? Copper Glo took the residue off beautifully. Thanks Copper Glo for easy use! Thanks so much for sharing this additional use for this slightly acidic product. I would assume that this property was what caused it to do so well for removing hard water residue. You can read other tips for removing hard water residue here, or share your own tips. This Is The Best Copper Cleaner Or WAS! I am totally surprised the company discontinued making it. I do not like any of their other cleaners for copper pans! I've tried them! Copper Glo has been used for a very long time in our family since my Mother-in-law first told me of it in 1967. Discontinued???? Are you kidding me? I have tried everything and nothing holds up to Copper Glo. I have very expensive stainless cook wear and this product is the only thing that cleans and shines it. It is very hard to find. The last time I ordered a case by phone. It is all gone now. Seems like every time you find a product that works, it gets discontinued. What a crock!!! I know what you mean! Very frustrating, isn't it? Here are some more stainless steel cleaner reviews for you to check out, since it sounds like you need to find something new. Hope they help! I use Kleen King Stainless & Copper Cleaner. It works just as good as the old Copper Glo. I have used Copper Glo cleaner since 1973 when I purchased a set of stainless steel cook ware. I can't do with out it. I have done an in store demo or anything for free just to prove how important it is to keep this product!!! Got to have in Georgia. I cannot believe that I cannot find Copper Glo in the stores anymore. I am so surprised that it was discontinued. I wish I had known as I would have stocked up on it. It keeps my Revere Ware pots and pans looking wonderful. Is it possible that it might be found somewhere? I would like to know. Help. I need a few cans. How sad this product was the only cleaner that worked with out any scrubbing. My pots and pans would shine. What brain child discontinued it? They should be shot. There is no replacement for it either...I tried them all. Please bring it back! 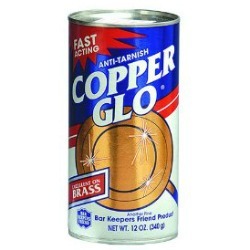 Why would such a great product such as Copper Glo be discontinued? Maybe it worked too well. un-iodized/kosher table salt and citric acid, found that lemon juice worked fine. Whatever caused this company to discontinue what was the best copper cleaner in the USA? Probably a decision made by "bean counters" not marketing people. Their "Barkeeper's Friend" is not as good. I bet the decision was based on cost savings in packaging/shipping/selling a single product, not two. No thought about serving the public of course. Unless it was a toxic product, discontinuing "Copper Glow" was a dumb move. Why no response from the foolish manufacturer that discontinued this product? I have pots from Carico. This cleaner is second to none. Had I know it was going to be discontinued I would have stocked up. I have yet to find a cleaner that clean and shine my pots like Copper Glo. Great on hard water and rust stains! This is the best cleaner I have ever tried on rust stains! Upset that it is discontinued!